ww2dbaseThe two Lexington-class ships were originally designed as battle cruisers, but on 1 Jul 1922 they were reclassified as aircraft carriers after the recent aircraft innovations. Her powerplant was enormous. In the winter of 1929-1930, a power shortage materialized in Tacoma, Washington United States. Lexington was called in to provide electric power to the city for thirty days. Between her launch and WW2, she participated in the annual fleet problems at Hawaii, in the Caribbean Sea, off the Panama Canal Zone, and in the eastern Pacific. ww2dbaseAt the start of the Pacific War, Lexington narrowly missed destruction at Pearl Harbor. She was at sea with Task Force 12 carrying Marine aircraft from Pearl Harbor to Midway when the Japanese struck. She launched aircraft to hunt for the retreating Japanese fleet, but returned to Pearl Harbor on 13 Dec 1941 without success. 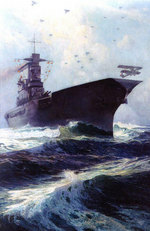 On 14 Dec, she sailed to relieve Wake by attacking the Japanese garrison on Jaluit, then on 20 Dec the mission was changed to directly support Wake, but the mission was ultimately canceled as Wake fell on 23 Dec. She returned to Pearl Harbor on 27 Dec.
ww2dbaseIn Jan 1942, Lexington became the flagship of Vice Admiral Wilson Brown of Task Force 11. In this role, she was attacked by Japanese aircraft while en route to Rabaul, but her aircraft performed superbly and averted any damage on the carrier. ww2dbaseBetween Feb and early Mar 1942, Lexington performed patrols in and near Coral Sea, launching aircraft to support New Guinea when call upon. She returned to Pearl Harbor on 26 mar. She left Pearl Harbor on 15 Apr and joined Task Force 17 on 1 May. Task Force 17 then sailed for Coral Sea to respond to a potential Japanese fleet movement. 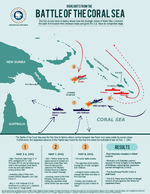 ww2dbaseWhen the American and Japanese fleets met, the ensuing action later became known as the Battle of Coral Sea. On 7 May 1942, Lexington's air group scored the first sinking of the battle, destroying the light carrier Shoho. Later in that day, her aircraft also played a major part in destroying 9 out of the 27 attack aircraft from Shokaku and Zuikaku. On 8 May, one of her aircraft located the Shokaku group; an attack was launched that left Shokaku heavily damaged. At 1100 on 8 May, however, Japanese aircraft penetrated the American anti-aircraft screen. Two torpedoes struck Lexington on the port side at 1120, followed by three bomb hits from dive bombers. Fires raged aboard the carrier, and a list of 7 degrees developed. It was originally thought that by 1300 both problems were under control, but as she prepared to recover her air group, gasoline vapor was ignited below decks, once again starting major fire. At 1558, Captain Frederick Carl Sherman ordered all hands to the flight deck, and at 1701 the order to abandon ship was given. Sherman and the executive officer Commander Morton T. Seligman were the last to leave the ship. Lexington was scuttled by two torpedoes from destroyer Phelps at 1956. 1 Jul 1922 The incomplete battle-cruisers USS Lexington and USS Saratoga were authorised for commissioning as aircraft carriers, expanding greatly the US Navy’s seaborne air power beyond the still experimental USS Langley. 14 Dec 1927 Lexington (Lexington-class) was commissioned into service. 5 Dec 1941 USS Lexington departed Pearl Harbor, Hawaii Islands to ferry US Marine Corps SB2U Vindicator dive bombers to Midway Atoll. 14 Dec 1941 US Navy Task Force 11 with USS Lexington, three cruisers, and nine destroyers set sail for the Marshall Islands, acting as decoy in attempt to lure Japanese naval vessels out of the Wake Island area. 17 Dec 1941 USS Lexington ordered to sail north to join Task Force 14 to reinforce Wake Island. 27 Dec 1941 USS Lexington arrived at Pearl Harbor, US Territory of Hawaii. 22 Jan 1942 American carrier Lexington departed to raid Wake Island. 23 Jan 1942 American oiler USS Neches was torpedoed and sunk by Japanese submarine I-72 70 miles southwest of the Hawaiian Islands at 0319 hours, killing 57. Without this source of fuel, USS Lexington and her task force cancelled the Wake Island raid. 31 Jan 1942 American carrier USS Lexington was ordered to sail south to cover the return of carriers USS Enterprise and USS Yorktown from their Marshall and Gilbert Islands raid. To that end, she set sail for Pearl Harbor, US Territory of Hawaii with Task Force 11. 1 Feb 1942 USS Lexington supported the air offensive against Marshall and Gilbert Islands indirectly by operation in the vicinity of Christmas Island. 2 Feb 1942 While at sea, USS Lexington received orders to set sail for Canton Island, Phoenix Islands. 5 Feb 1942 USS Lexington crossed the Equator. 6 Feb 1942 While at sea, USS Lexington received orders to set sail for Fiji. 14 Feb 1942 18 G4M1 Type 1 land attack aircraft of the Japanese Takao Air Group arrived at Vunakanau Airfield near Rabaul, New Britain. 16 Feb 1942 USS Lexington set sail with US Navy Task Force 11 for a raid on Rabaul, New Britain. 20 Feb 1942 A Japanese H6K flying boat piloted by Lieutenant (jg) Noboru Sakai spotted a US carrier force 460 miles northeast of New Britain; US pilot Jimmy Thatch of USS Lexington shot down Sakai's aircraft at 1112 hours, but not before Sakai had alerted others. At 1202 hours, Burt Stanley and Leon Haynes shot down another H6K aircraft, flown by Warrant Officer Kiyoshi Hayashi, north of Lexington. At 1420 hours, 17 Type 1 bombers of Japanese 4th Air Group, led by Lieutenant Masayoshi Nakagawa, were launched from Rabaul, with the first wave reaching Lexington at 1625 hours. The first wave of 9 bombers were all shot down without causing any damage to Lexington; Nakagawa tried to crash into Lexington as he fell from the sky, but fell short by less than 1 mile). The second wave attacked USS Lexington and USS Minneapolis at 1705 hours, still causing no damage; Edward "Butch" O'Hare shot down 3 and damaged 4 Japanese bombers. Only 2 Japanese bombers arrived back at Rabaul at the end of the day; 100 Japanese bomber crewmen were lost during the attacks, and Japan also lost 20 men with the H6K reconnaissance flights earlier in the morning. O'Hare was given credit for 5 kills, making him an "Ace in a Day" and setting him up for a Medal of Honor award. 6 Mar 1942 USS Lexington made rendezvous with USS Yorktown and sailed for a raid on Rabaul, New Britain. 10 Mar 1942 USS Lexington launched aircraft to attack the Japanese invasion force at New Guinea. 20 Mar 1942 USS Lexington set sail for Pearl Harbor, US Territory of Hawaii after raiding New Guinea. 26 Mar 1942 USS Lexington arrived at Pearl Harbor, US Territory of Hawaii and prepared for an overhaul in the drydock. 13 Apr 1942 USS Lexington departed Pearl Harbor, US Territory of Hawaii to rendezvous with USS Yorktown for a raid on Rabaul. 15 Apr 1942 USS Lexington was assigned to US Navy Task Force 11. 18 Apr 1942 USS Lexington ferried US Marine Fighter Squadron 211 and its F2A Buffalo aircraft to Palmyra Atoll, Line Islands. 20 Apr 1942 USS Lexington arrived in the South Pacific. 22 Apr 1942 USS Lexington arrived at Tongatapu, Tonga. 5 May 1942 USS Lexington made rendezvous with USS Yorktown south of Tulagi, Solomon Islands. 8 May 1942 USS Lexington was damaged by bombs at 1120 hours during the Battle of the Coral Sea, killing 191. At 1247 hours, the leaking gasoline was detonated by fire, killing a further 25. At 1707 hours, the 2,735 survivors abandoned ship, and the carrier was scuttled by 5 torpedoes from destroyer USS Phelps at 1915 hours. 4 Mar 2018 The wreck of USS Lexington was found on the seabed about 800 kilometers (about 500 miles) east of Australia. In fact six Lexington Class Battle cruisers were laid down in 1920-1921 (Lexington CC-1 Constellation CC-2 Saratoga CC-3 Ranger CC-4 Constitution CC-5 and United States CC-6). Only two survived the cuts imposed by the Washington Treaty 1921-1922 and these finally emerged as Aircraft Carriers in 1927. Don't mean to sound like a nit-picker but the caption that lables "Saratoga4" as a battlecruiser is clearly in error. What we have is a wonderfull broadside view of Sara as finished as our first real carrier. The main give-away are the distictive 8inch gunned turrets which she kept until her first serious refit and then they were replaced with 5inch dual mounts which could elevate and track fast enough to be the standard hv.AAA gun for the USN up to this very *** . Thank you for allowing this chance ti provide a corection. BTW-Love this site! Lt.'Butch' O'Hare's name was already well known in his home town of Chicago thanks to his infamous father 'Easy Eddie' who for many years was Al Capone's personal attorney. 'Easy Eddie' later testified against Capone and within a year was shot dead, allegedly by one of Capone's mobsters. My Uncle, Wendell Carrick just recently died. He was on the Lexington and ended up with a group of sailors considered MIA in Tonga. I would love to find more information about their time in Tonga before being located. My father, John David Combs. I would be pleased if anyone could tell me if he is listed anywhere? I believe he was nearly the last one to get off the Lexington, after rescuing many, or so the story goes that I was told. The story is that he collapsed and then managed to dive into the water, which nearly killed him. My Uncle was a survivor. His name was Willard ( Bill ) Ashpole. Anyone know him? My grandfather James Doyle from Salem Mass served on the Lexington. My step father always claimed he was a Pearl Harbor Survivor but now I read the Lexington (on which he served) was not in Pearl Harbor at the time of attack. So can he officially declare he is a Pearl Harbor Survior? I served in the 94 man Marine Detachment on the USS Lexington CV2 in 1941 & 1942. I am a Coral Sea Battle Survivor. Contact me by email for photos & documents. Last Historial USS Lexington CV-2 Minutemen Club. I was told my grandfather served on the Lexington when it was sunk in 1942. I was told he held a high rank possibly a rank right below Captain. His name is Harold or Hal Long. I was also told he helped swim sailors to safety after the Lexington was sunk. If anyone has information about it please let me know. My grand father always told us stories of the battle. He was on Cv2 when she was sank. I can't find any information . His name is Charles Wesley Lynch from Texas. Any info would be great. According to Navy Muster Rolls, Charles W Lynch enlisted 18 Jul 1941 at Houston, TX (service number 360 42 79). He was received aboard the Lexington as an Apprentice Seaman on 13 Oct 1941 from the Naval Training Station at San Diego, CA and a month later, he was elevated to Seaman 2nd class. In Mar 1942 he spent a week in gunnery school at Puuloa, Hawaii. On 18 May 1942, 10 days after Lexington was sunk, he was transferred off Lexington’s books to an unspecified personnel pool. 17 months later, as a Signalman 3rd class, he appears as a passenger aboard the USS Long Island from Noumea, New Caledonia to San Francisco, California, arriving 25 Nov 1943. On 15 Apr 1944 he was received aboard the Hancock from the Receiving Ship at Boston, MA. He appears in Hancock’s Muster Rolls through 30 Sep 1944 and his last entry in the Muster Rolls was as a passenger aboard the oiler Kaskaskia in Oct 1946. To learn even more about his Navy service, request a copy of his service record. See http://ww2db.com/faq/#3. a family member of ours was serving on the uss lexington and we were told he wasnt a survivor. His name was Robert Vandling. How can i find a list of the crew members that were a bourd the ship at that time. My Uncle served on this ship according to records I have found can you confirm. Kenneth F. Rodda from Lasalle Il. Kenneth Fred Rodda does not appear in Lexington Muster Rolls but he is listed in Langley Muster rolls before being listed as a plank-owner in the carrier Franklin where he remained aboard through the tremendous fires of 19 Mar 1945. His Navy service number was 300 33 25. I have tried on many different sites to find out about my father who I am to believe served on the Lexington CV2. I did find a site that had his name on it but cannot find it now, his name Montgomery H L FC 1. Later he became a LT JG.